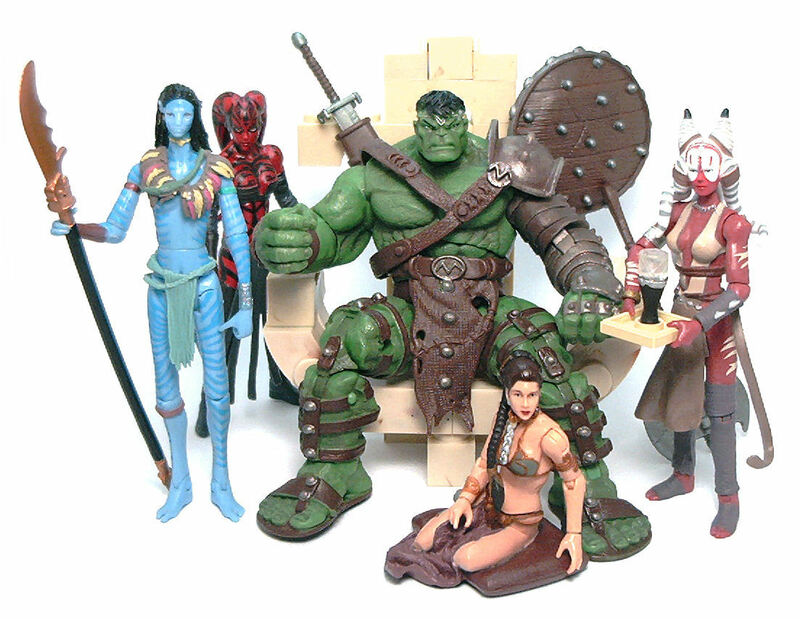 When images of the third figure in the third series of Marvel Universe action figures started to appear online last year, I knew that the World War Hulk would be one I had to add to my collection. The figure has a lot going for itself: an impressive amount of detail, superior articulation and useful accessories, which is something of a rare thing when it comes to the Marvel Universe line. 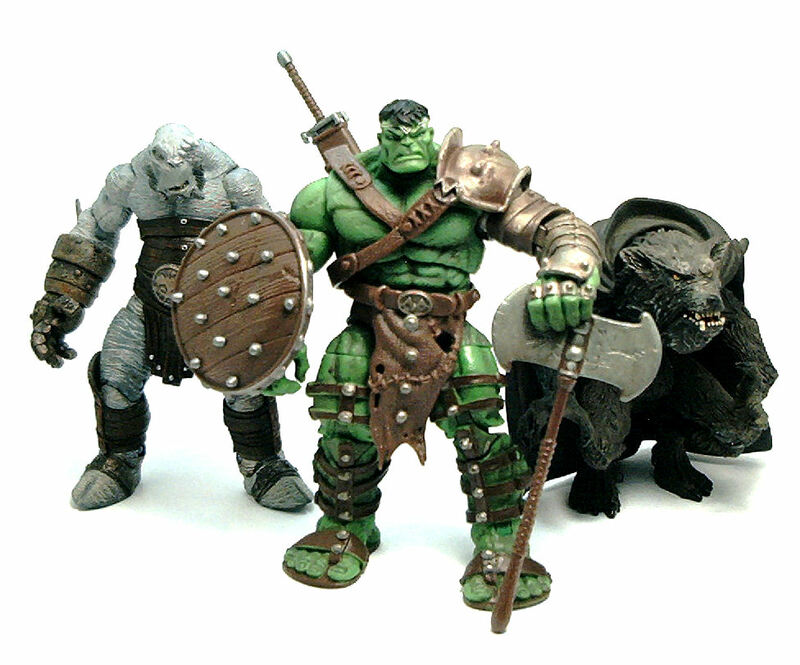 The base sculpt is insanely detailed; while the previous Hulk versions all had rather smooth skin textures, WWHulk’s looks much more realistic and full of the small hairline cracks and grooves you could see on the back of your own hands. 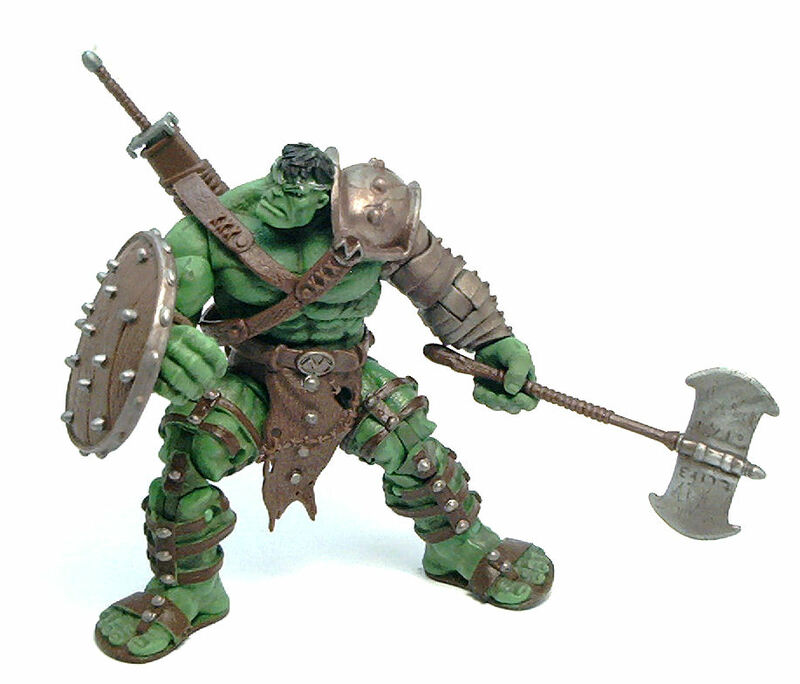 The figure is also very bulky, although not quite as broad as those other first renditions of the Hulk. 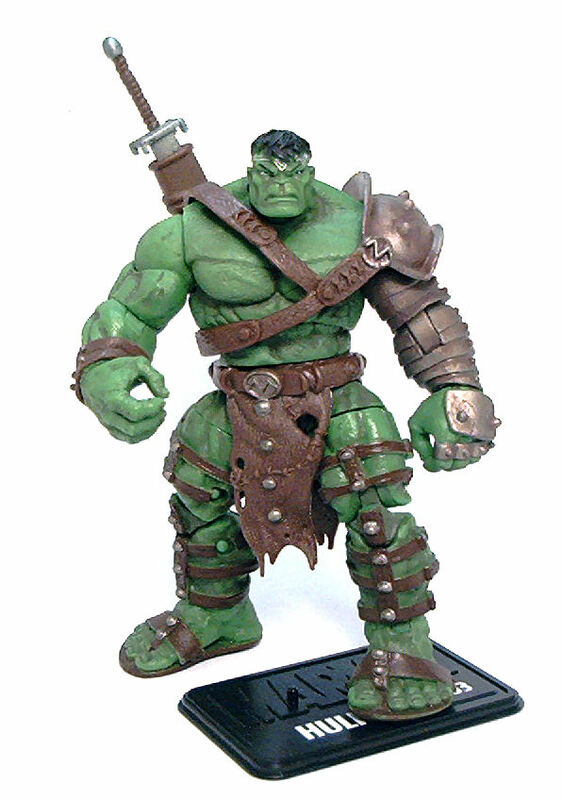 What sets this Hulk apart is the gladiator-like attire he wears. 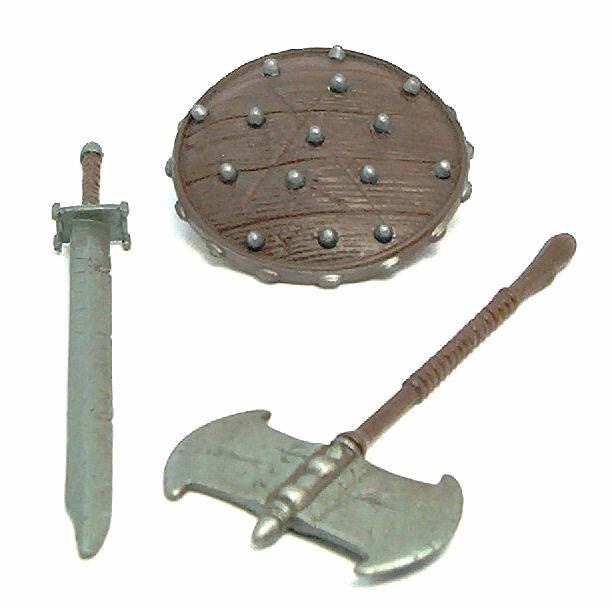 Some of the armor is removable, like the left pauldron (which also includes the scabbard for his sword), the leather loincloth and the right wristband, but the left arm is sculpted with overlapping bands of metal covering it entirely from shoulder to knuckles, while the legs have studded leather straps around them and the head sports a thin tiara. The face under the tiara is classic Hulk, with broad features and a simmering anger lurking just beneath the surface. 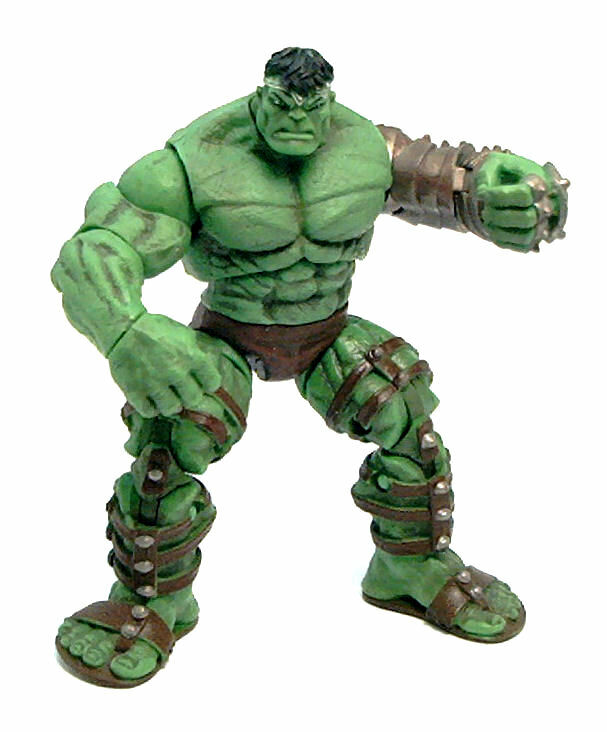 In contrast, the torso and right arm are sculpted in a fairly generic fashion, and no doubt will be used for future versions of the Green Giant or used for characters of similar bulk. • Peg & hinge shoulders. And the best part is that all of these joints work just fine. Sure, there are some limitations imposed by the sheer size of some of the pieces, but overall this guy is pretty much as versatile as any other figure in this line, thanks to the extra upper thigh articulation, even though I think that was not the most aesthetically pleasing way to add some movement range there. The paint job on World War Hulk is good, but it’s not without issues. On the positive, a very subtle shading wash was applied over the whole figure, enhancing the sculpted skin textures and providing a tarnished metal appearance to the armor bits. Also, the eye and hair paint applications are very neat, although the hair highlights are accomplished by wiping some of the black paint to show the green plastic underneath, which kind of looks just like a paint rub instead of a conscious effort. On the negative, the brown paint used for the leather straps on the legs doesn’t really cover the edges entirely, which can be rather distracting and there is some degree of stray paint splotches. Also, apparently only the studs at the front of the loincloth merited some paint, despite having similar elements painted on the back and all around the belt area. 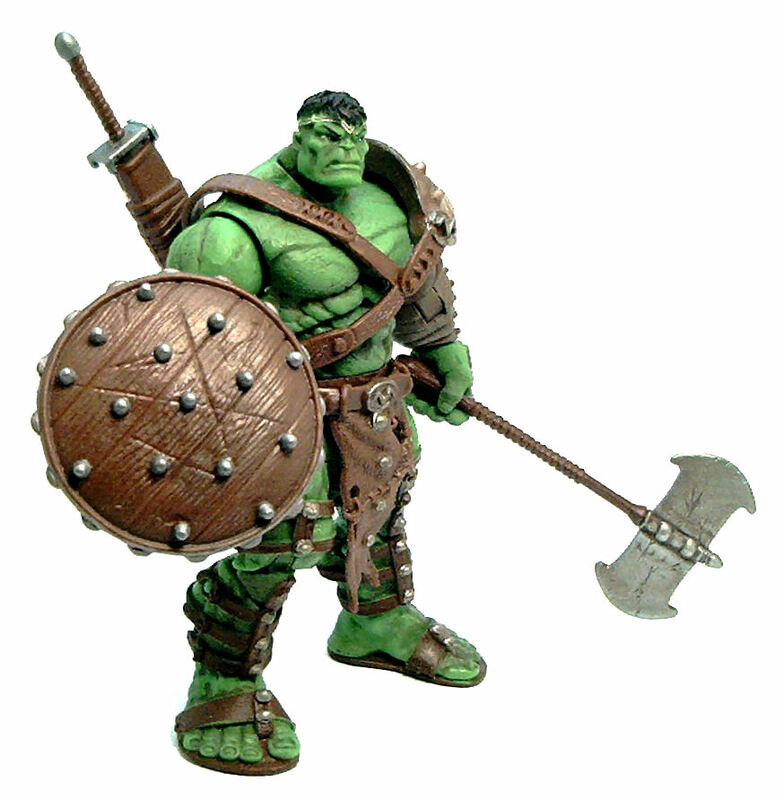 In addition to the pieces of armor, Hulk comes armed with a big sword, a double-headed battleaxe and a studded buckler. Both the sword and the axe have the same tarnished metal finish as the armor, and both display signs of wear and tear in the form of nicks and scratches on their surfaces. 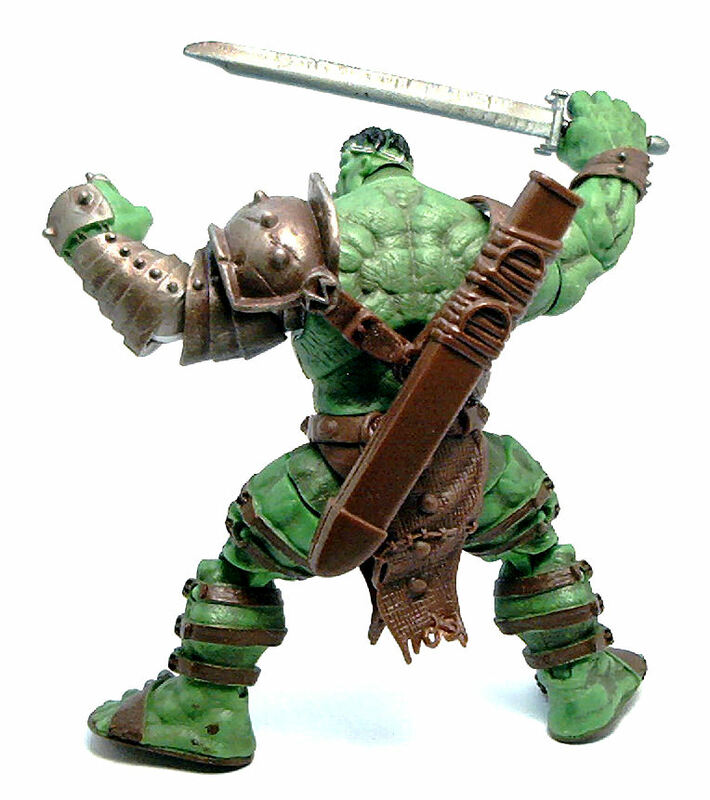 Both the sword handle and axe shaft appear to be too thin for the Hulk to grab them firmly, but are the right size for other figures, which makes me thing that maybe Hulk’s hands are the ones sculpted in a too loose grip, instead of the weapons being too thin. Other than the weapons, WWHulk comes with a black plastic display base, with his name and the number 003 printed in white font underneath the engraved Marvel logo. Hulk doesn’t really need the base to stand, and having any one foot on it covers either the name or the number, thus diminishing it’s usefulness even more, but it’s the principle that counts. Bottom line, World War Hulk is an immensely fun figure to have. 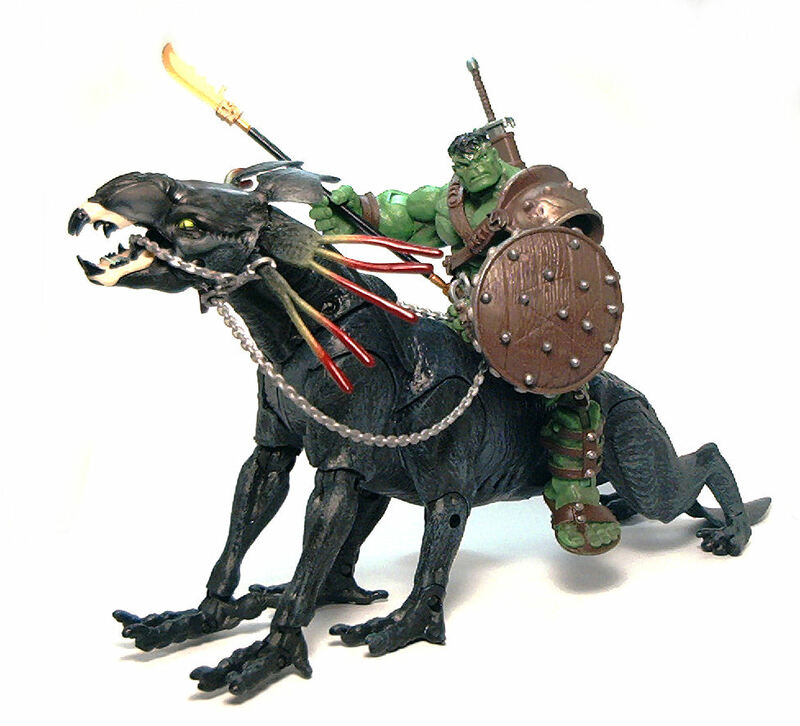 The character design lends itself to a lot of scenarios that don’t necessarily involve superheroes like, say, as part of Jabba’s entourage or as a half-orc barbarian in a fantasy-oriented setting. Even as a stand-alone purchase, I wouldn’t hesitate to recommend this figure. Wow. I have to say this figure looks cooler out of the package than he does in it. I’m not a Hulk fan, but I’m tempted. Fantastic pics!